Let us worry about copyright. We’ll do the work for you. LOCR ensures that only your students can access your course materials. In order to provide this service, the Library requires that you and your students log into their learning management system such Canvas, or to the standalone LOCR page using CWL in order to access and upload course materials. 1. Log into LOCR with your CWL login. 2. Under My Courses click on the desired course. This should bring up the readings for this course. 3. Please see the Adding Items tab above for how to add items to your course reserves. Fill out the search form. For items that may have multiple versions, editions, or translations, try to provide more precise information such as a DOI, ISBN, or Call Number. Scroll through the results list and click on the Select button. You can use the View button to verify if the item is the one you want before you select it. Use the Submit Item screen to verify or edit item bibliographic details and click on the Submit Item button. You can set individual item dates if you want to delay the release or expire an item within your default course dates. You can also indicate if an item is a required reading, set loan periods for physical items, and, if you scroll down, you can toggle the notes field to write notes to your students or add descriptive tags (e.g. Week 01, Unit B). If you cannot locate your item, click on Restart Your Search to try again. You can also click on Enter your request manually here to type in information yourself. For fastest turnaround, please provide as much detail as possible. If you have used electronic course reserves for another course, you can quickly import all your readings into a new course section. Go to your target course and go to the Add Reserve Items tab. Your previous and current courses will be listed at the bottom of the page. You can copy the entire list of course readings or select individual items to import. Please note that physical items such as books and PDFs requiring copyright clearance will need to be reprocessed. There are eight options when adding materials to your course reserves. Each icon leads to a streamlined form for adding items to your course reserves. Article: Search the Library’s online journals for articles to add to your course reserves. Articles are available instantly for your students. Chapter/Excerpt: Search the Library’s book collection and request a chapter or page range be digitized and uploaded for your course. Requests meeting UBC’s Fair Dealing guidelines will be scanned and released within 10 business days. Anything that does not meet our Fair Dealing guidelines will require special copyright permission and may take longer. In such cases, the time required to obtain permission depends on the publisher, and can take up to four weeks. If we cannot secure permission, we can still place the book on physical reserve. DVD/CD & Streaming Media: Search the library’s media collection including DVDs, CDs and streaming media. DVDs and CDs may take up to 10 work days to process depending on the time of year and branch. Streaming media requests will be reviewed within 1-3 business days to ensure that there are no access issues for your students. Request Purchase: Allows you to submit a purchase request for the Library to acquire a resource to add to its collection. Be sure to check Summon before submitting a request. Web Resources: Add a web resource such as a news story, YouTube video, or blog post. New requests will be reviewed within 1-2 business days to ensure that there are no copyright or access issues for your students. PDF Upload: Upload a PDF that you already have for expedited copyright review. Files that meet UBC’s Fair Dealing guidelines will be reviewed within 5 business days but may take up to 10 business days during busy periods such as the start of term. Any file that does not meet Fair Dealing requirements will require special copyright permission that could take longer. Physical Item: Submit a request to place an object (e.g. geological samples) or a personal copy of a book on physical reserves. Use the search box above your readings to quickly locate items. The search box will quickly filter down to the exact item you need. You can search by Title, Author or tag. Organize your reading list with the drag and drop feature. Students have the option to sort their reading list alphabetically. Required Information: This will display and allow you to edit title, authors or pages. Optional Information: This will display and allow you to edit additional bibliographic information such as publisher. Notes & Tags: You can add or delete notes for your students, notes for library staff and tags to describe items. Item Views: You can check to see if your students have clicked on an item through the course reserves system. Please note that if students access readings externally from the system, this will not be tracked. Item History: You can review the processing history of your item. Request Options: You can change item availability dates, indicate if an item is required, and, for items on physical reserve, change loan periods. You must click Save Changes when you are done. If you wish to delete an item from your reading list, click on . Instructors can review the current status for items in the Reading List. The system now has nearly 30 statuses such as Awaiting Recall and Scanning Library Copy so you can see exactly what work is being done on your behalf. If you have any questions about an item status, please contact your course reserves branch for assistance. You can switch to Student Mode at the top left to verify how students see items on course reserve. Items are only visible to students after they are made available. If you or your students encounter any errors accessing a library resource, it is possible that an electronic resource is unavailable. Please contact your Library Course Reserve branch immediately for assistance. The default course dates in LOCR are adjusted from the course dates in the Student Information System. LOCR adjusts these dates to make items available two weeks prior to the start date of your course section and thirty days after the end of the term of instruction. Please note that the Library and the Rights and Permissions Office currently do not support 'Continuous' courses - all courses need to have a Start Date and an End Date. If you need to change the start and end dates of your course, please follow the instructions below. Alternatively, LOCR will also accept a custom course end date specified by checking "Students can only participate in the course between these dates" and filling out the custom start and end date fields seen in the course settings. More information about these settings is found in the Canvas guides. Without a term association end date or custom end date, LOCR will assume the course has finished and prevent students and instructors from accessing the associated LOCR site for the course. Please note that changes to start and end dates after course materials have already been requested in LOCR will impact any copyright material that has been licensed by the Permissions Office. LOCR communicates with Connect to ensure that all students, TAs, and instructors have access to course readings. Students will automatically be added to your course upon enrollment. If you have just added an individual, please allow the system to update over night. 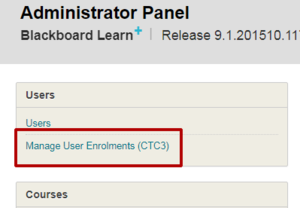 If you are not teaching a course in Connect, contact your support person and request access for secondary instructors, TAs, and other support staff via the Manage User Enrolments (CTC3) tool (refer to the screenshot below). To locate your contact, please visit the following list of Instructional Support Units. Note: Adding new students, TAs, or instructors in Canvas is still to be determined. Note: Instructions on if your course reserves do not appear or are broken in Canvas is still to be determined. Course Reserves does not appear or broken in my course in Canvas? LOCR operates completely separately from Canvas and your course reserves will not automatically carry over. If you have already entered your items, you can easily import them into your new course using the instructions for copying items from previous courses. Please note that Book, DVD/CD and PDF items will need to be reprocessed by library staff before they are released to your students. Why do I need to log into LOCR? LOCR verifies that students are properly enrolled in your course. By restricting access to registered students, we can provide better and more targeted services such as providing access to licensed library resources and PDFs created from print materials under Fair Dealing. Items will only be visible to students after they are available. If an item is still being processed, it will not be visible to students. Students will not be able to access items until the term begins. If you have changed the default availability of an item, it will not be visible to students until the date you selected for an item and you can change this by editing item information. Can I post my lecture slides, notes or handouts in Library Course Reserves? The Add Reserve Items and Help tabs won't work. What do I do? Some early versions of browsers are not supported. If you are experiencing problems we recommend that you switch to a secondary browser such as Google Chrome or Mozilla Firefox. Please note that we do not currently support non-credit or workshop courses. If you have non-UBC participants or auditors, they will not have access to Library resources and should locate items through their local library. How quickly an course reserve item becomes available for use by the students in a course depends on a variety of factors. It can happen almost immediately (Library owned electronic article) to several weeks (copyrighted material requiring permissions from the copyright holder). Please submit your course requests as early as possible prior to the start of term (at least one month) to help us make sure your request is available at the first meeting of your course. Remember, requests are processed in the order in which they are received. Material not available in an electronic format (ie article or book chapter) must be reviewed by the Permissions Office. They will determine if the item can be scanned and uploaded under the UBC Fair Dealing Guidelines or if permission must be obtained from the copyright holder. If copyright clearance is required, the Permissions Office will seek the copyright clearance from copyright holders including publishers. Clearing permissions vary amongst publishers and resolving them can take up to 4 weeks or longer. Copyright review and clearance of copyrighted material must happen each time a course is offered. This is the case even in instances where clearance has obtained for a course taught in the past. Following the submission of the requests, it can take up to 10 business days for a fair dealing assessment or up to 4 weeks or longer if permission must be sought from the copyright holder. Note: If the Library does not own the item, it will take longer than the times below as the Library will have to obtain the item. Electronic articles – Immediately when the article is requested and submitted in LOCR. Physical articles - Up to 10 business days for the article to be reviewed to determine if the Fair Dealing Guidelines allow the article to be scanned and uploaded into LOCR. It will take longer (4 weeks or more) if the Library needs to obtain permission from the Copyright owner. Electronic books – 1-3 business days. The Library needs to ensure that there are no access issues. Book Chapters/Excerpts - Up to 10 business days for the book chapter/excerpt to be reviewed to determine if the Fair Dealing Guidelines allow the chapter to be digitized and uploaded into LOCR. It will take longer (4 weeks or more) if the Library needs to obtain permission from the Copyright owner. Streaming video - 1-3 business days. The Library needs to ensure that there are no access issues. You can request the Library to purchase material for your course using the Request to Purchase option. The material will be obtained as quickly as possible but can take several weeks or longer in some cases. Uploading a pdf that you already have will expedite the copyright review process. Files that meeting UBC’s Fair Dealing guidelines will be reviewed within 10 business days but may take up to 15 business days during the busy periods such as the start of term. Any file that does not meet the Fair Dealing requirements will mean obtaining copyright permission that could take 4 weeks or longer. Linking to a web resource such as a news story, YouTube video, or blog is possible. Requests will be reviewed within 1-2 business days to ensure that there are no copyright or access issues for you students. Placing a personal copy of a book or an object (e.g. geological samples) can take up to 10 days depending on the time of year. To access Course Reserves, follow the steps outlined below for the Standalone LOCR site or Canvas. 2. The courses you are currently enrolled in with course reserves will display under My Courses. Select the course to access the course reserves. You can access your course reserve readings in LOCR from your Canvas course. 3. Click on the appropriate link for your course reserve item. Your list of course readings is in the order submitted by your course instructor. The item list include Title, Format, Author, Call Number (if on physical reserve at your library branch), Pages, Availability Date and Tags. If you've already clicked to access a resource, you will see a Yes under the Read column. The Search box will allow you to quickly filter down by Title, Author or Instructor Tag. Clicking on any title will take you to a record with further information about an item. You can connect to electronic items from this page or link to the item record to see if it is available at your library branch. The Item record window will include a View Item button that will launch to the library record or download a PDF. If your instructor has left special notes on your item, they will appear on this screen. Article: This will open to an electronic journal article available through the Library. If an article is available in multiple databases, you may be asked to select one. Book: This is a physical book available in your library branch. The item record will open to a catalogue record with the call number and branch. PDF Chapter: This is a scanned PDF from a Library resource. The PDF will download automatically to your desktop. PDF Upload: This is a PDF uploaded by your instructor. The PDF will download automatically to your desktop. Web Resource: This is a hyperlink to a website on the internet. The resource will link to a resource outside of UBC. DVD/CD/Media: This will link to a catalogue record for a DVD or CD available through the library or an online streaming media resource available through the library. Physical Item: This is is physical item placed on reserve by your instructor for your course. If you encounter any errors accessing a library resource, it is possible that an electronic resource is unavailable. Please contact your Library Course Reserve branch immediately for assistance. You must be enrolled in a course to see it in LOCR. Please make sure that you are properly enrolled in your course or contact your instructor to have them add you. If you have recently been added to your course, please allow one night for course reserves to update with your enrollment information. Course reserves must be returned during open hours to the Circulation Desk of the Branch where you borrowed them. Digital Course Support Items can be made available through Library Online Course Reserves (LOCR) link in Canvas or the standalone site. Access is restricted to students actively enrolled in your course. Links to appropriately licensed online articles and websites will be made available once library staff have verified the site’s terms of service and copyright notice. Please ensure that you are linking to an authorized rights holder. Items in the Library’s physical collections (e.g. books, DVDs, CDs, etc.) can be requested for short-term loan to ensure students have access. Requests are made online via LOCR. Personal copies of items can be made available through Library Reserves. Please use the Instructor-Supplied Content: Physical Item option when adding reserve items in LOCR. Please add a note in the Request Item Note field that you are bring the item to branch. The item will be processed and made available within 14 days of receiving the item at the Library branch. This includes non-tradition items (i.e. geological samples). Personal PDFs of photocopied chapters or articles can be made available in LOCR by using the Instructor-Supplied Content: PDF option when adding reserve items in LOCR. Personal PDFs require review by the UBC Copyright Office. This may take up to 4-6 weeks to process. UBC Instructional Support Units lthub.ubc.ca/support/instructional-units Instructional support units provide specific technical and functional support for learning technologies (Connect, Canvas, etc.). Specific contacts for UBCO and all UBCV faculties are listed here.